Yesterday I walked past the Strand Bookstore near Union Square and couldn’t help but smile. Every New Yorker has one. The thing that brought them here — or, for the rare native — the thing that compelled them to stay. For me, it was simple: Ambition. There’s more to do in NYC. More things to do. More people to meet. More opportunities for advancement. That’s not to say I didn’t enjoy Philadelphia. In fact, I’ve liked it more and more every time I’ve returned. I just wanted more. So on Friday evenings, I’d sprint to 30th Street station and take the Bolt Bus up from Philly to New York and spend a manic weekend visiting art museums and SoHo boutiques and the only bar in the city that gives out purple shots to Northwestern football fans and burn myself entirely out by midday Sunday. Still, I’d dread the moment that I needed to wait in line outside of the Tic Toc Diner on 34th Street and take the bus back home. And then, a few weeks later, I’d do it again. I’d been applying for jobs and conducting informational interviews for the better part of 6 months before I decided that I just needed to make it happen for myself. So I moved home, saved enough money to keep me afloat for a half a year, found a roommate via a friend of a friend, and scouted my very first apartment in Astoria, Queens. Then I quit my job in Philly. “I’m moving to New York,” I told them. “Do you have a job?” they asked me. “I have an apartment.” I responded. My parents (naturally) were beside themselves. They grimaced. But they couldn’t say no. To me, even working at a Starbucks in New York would be better than doing anything for any longer in Philadelphia. And so, it was decided. I’d move on Saturday and meet with a temp agency on Monday. But then, on Friday, after saying goodbye to all of my colleagues in that tiny office in Old City, Philadelphia, my phone rang on the elevator ride down to the first floor. It was a friend from journalism school. And just like that, I got my first job in New York City. But the interesting thing about layoffs is that it can give the ones who remain more chances to explore new areas of the business. And everyone was stretched. So I started pinch hitting in different areas — helping the communications team out on events, project managing the editorial process for certain special interest issues, and (my favorite part of all) helping the books editor review new publications. Each month, I’d read through the list of upcoming new releases and order galleys from publishers all over the city. Sometimes I’d choose books that might relate directly to our editorial objectives. Other times, I’d just request books that I wanted to read myself. I started getting 3-8 new books delivered to me each week. If anything, it also proved to be a nice way to entertain myself without needing to buy books myself. “Is that allowed?” I asked. That weekend, I loaded up my classic NYC shopping cart full of books and hopped on the R train from Astoria to the Strand Bookstore in Union Square. I must have had 3o or 40 books piled up. Some of them, as he pointed out, earned me 50 cents or less. But for others, they would offer me $3 or $5 each. In the end, I received about $55 in cash for that first stash of books. Not bad, I thought. That’s nearly 4 hours of work at my hourly rate. In the end, I probably made a half-dozen trips to the Strand over my time at Prevention, selling back a few dozen books each time. That petty cash would become my weekend spending money. Maybe I’d treat myself to ramen in the East Village or a fancy cocktail in midtown. Or finally refill my stock of shampoo at home. What a time to be alive. I was 24 years old and surviving in a way that only New Yorkers learn how to do. I’m happy to report that I no longer need to sell books back at the Strand to make ends meet in NYC. But I still think back fondly to that very first year of figuring things out. Even now, I like to think I haven’t lost the New York hustle entirely. I just hustle for different things now — like scouring StreetEasy and visiting dozens of apartments a weekend until I find the perfect place or teaming up with people from all different organizations on new partnerships and non-profit initiatives. I guess that’s 8 years will do for you. I won’t claim to be a full-on “New Yorker” yet. But I’m getting there. 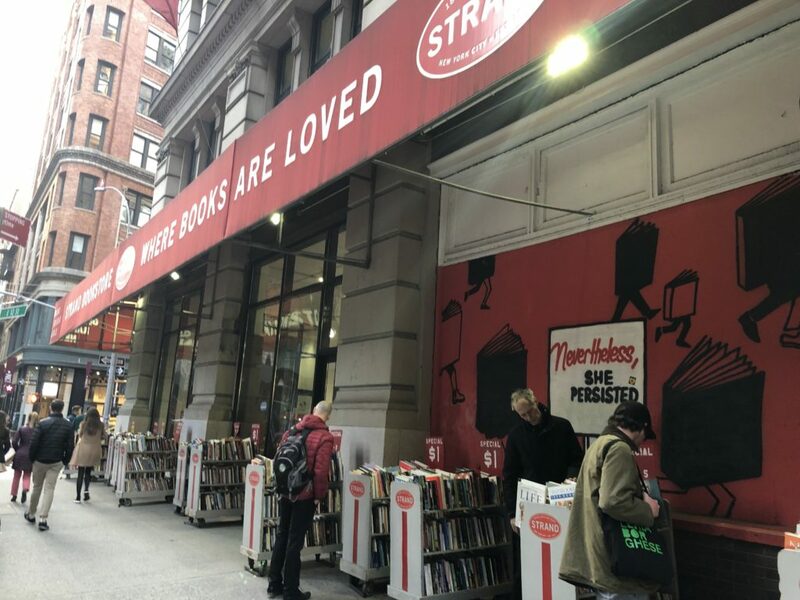 And if you still happen to be scrounging through in year one of your own journey, looking for some extra cash on the weekends, I’ll mention that the Strand still runs its book buy-back program. It might help you out in a pinch.